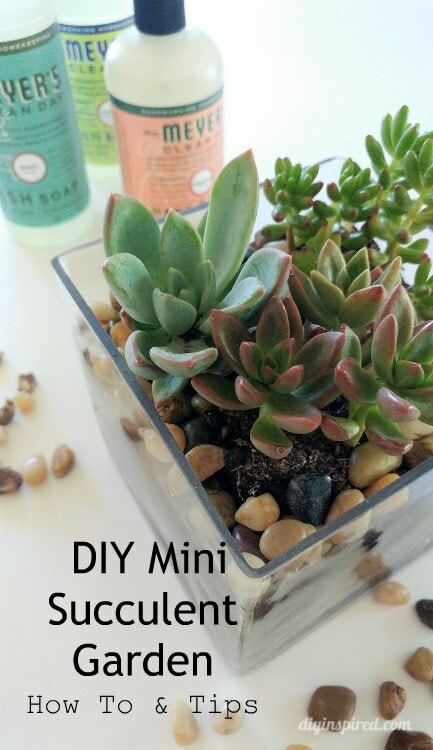 This article, DIY Mini Succulent Garden, is sponsored by Mrs. Meyer’s Clean Day®. I received product and compensation. All opinions are 100% my own. In honor of National Plant Something Day, I planted this mini succulent garden to give to a friend to welcome her into her new home. I love giving these as a housewarming gift because they bring life and beauty and with proper care, can last a lifetime. What is National Plant Something Day? Mrs. Meyer’s Clean Day partnered up with the American Community Gardening Association for the second consecutive year to encourage people to get out and plant in their own gardens and communities. Awesome idea, right? It’s an opportunity to get your hands dirty and to plant something at home or in your neighborhood. It can be anything! Plus, Mrs. Meyer’s Clean Day products are made with plant derived ingredients and work hard to help you clean up everything after you are finished planting. Start with clean hands and a clean glass container. I washed up with Mrs. Meyer’s Clean Day hand soap made with olive oil and aloe vera. The geranium scent smells amazing! Also, Mrs. Meyer’s Clean Day Multi-Surface Everyday Cleaner is great to clean your work surface and container. Layer your garden by first placing in pebbles, then moss, then soil. This will help keep your garden thriving since there is no drainage in a glass container. Gently remove each mini succulent one by one and transfer them to the container. Create small pockets for the roots and fill in spaces with extra soil. Place more pebbles on top of the soil and around the plant. Lastly, water the garden. Your garden does not need too much water; however, I tend to water more and less often. This method works for me. I have similar gardens all over my home and have had them for many years. As far as sunlight goes, succulents need a lot of light. The thing about succulents is that they will let you know if there is too much sunlight or not enough. Simply move it and it will flourish as you care for it. One more thing to mention – Mrs. Meyer’s Clean Day is also donating $5 for each mrsmeyers.com order from now until June 5 (up to $10,500) to the American Community Gardening Association. 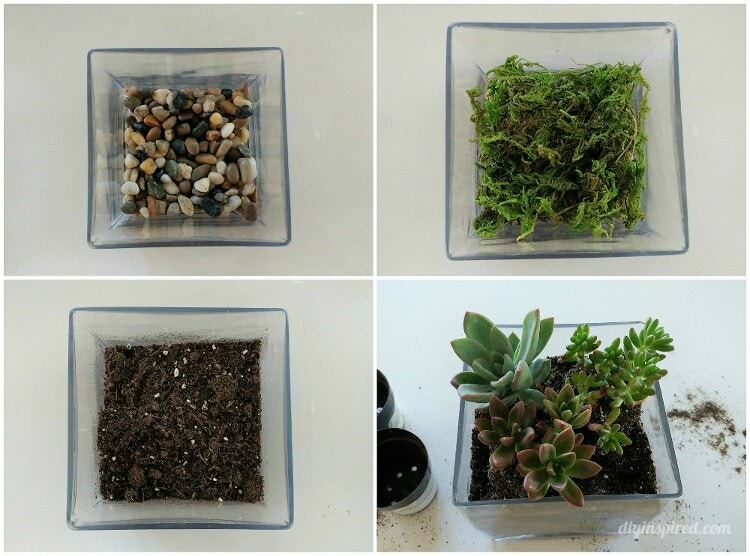 I hope you like this simple DIY and join me in planting your own today! 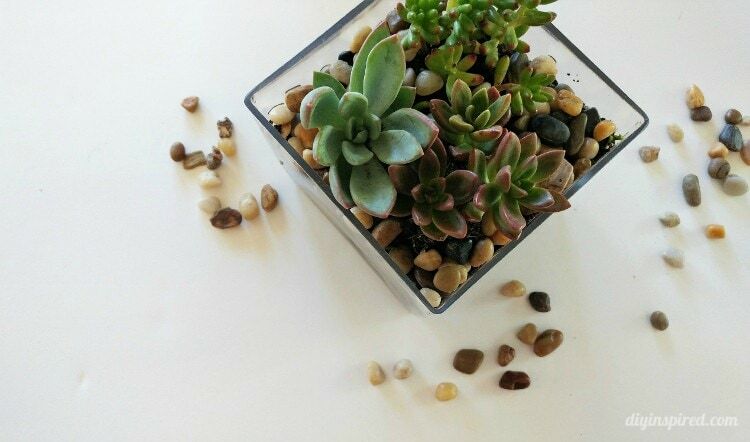 These adorable little mini succulent gardens make a great gift, party centerpiece, or home décor accent. What will you plant?